RYR, is a German artist who initially started out on the streets where he was honing his artistic skills through graffiti painting. 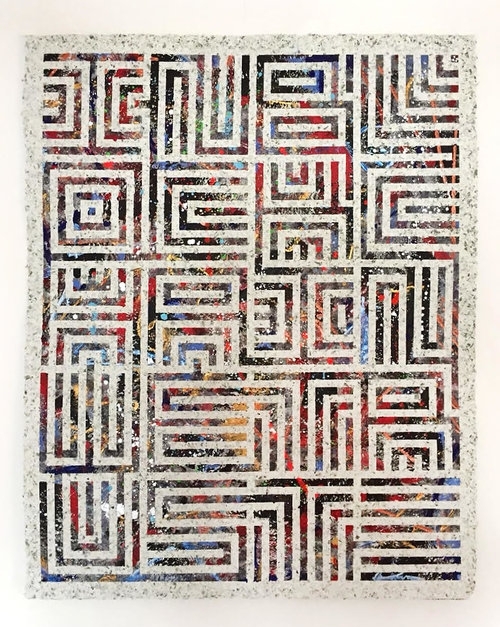 Before long, he made a bold decision to move into the studio where he continued to explore his creative interest in contemporary mediums, resulting in an art form. RYR makes his artworks out of money – handcrafted paper made of cellulose and banknotes from around the world. His recent approach is in highlighting the next kind of money - the cryptocurrency. As the artist himself is a strong believer in decentralized cryptocurrencies he's showing us keywords and generated quotes of the crypto community in his latest project called TO THE MOON. RYR's use of typographic riddles are a clever comparison to the block by block system of blockchain technology which is crucial to the formation of crypto money. Those cryptic words,constructed from mixed media on top of shredded FIAT currencies is telling us that cryptocurrency is here to stay. To finish the artworks within this project, RYR will allow himself to only accept a peer to peer payment process with bitcoin for his crypto themed art.